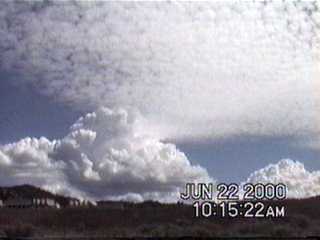 These photographs (video stills) taken on June 22 2000 reveal the synthetic nature of the cloud base which developed over Santa Fe NM on that day. 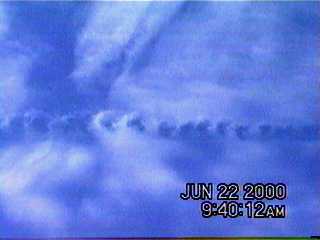 The first four photographs show the effects of a plane which recently passed, or “cut through” the cloud layer which was in the process of formation at this time. 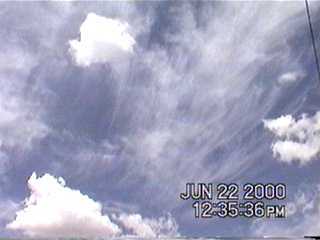 No direct spraying had been observed at this time, and these clouds rapidly entered into the Santa Fe skies at the jet stream level. 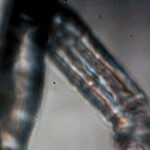 The first two photographs of the set of four are enhanced for brightness and contrast. The material that constitutes these “clouds” has been pushed away, or evacuated, with the passage of the aircraft. 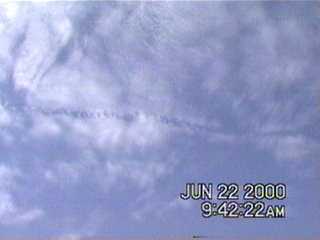 The aircraft itself left no trail whatsover, only the visible after effect of its passage was noted and recorded. 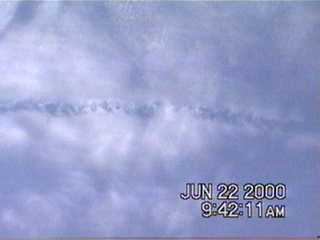 This particular aircraft shows the effect of the absence of mass after passage, and it therefore provides us with a different perspective of the substances overhead. 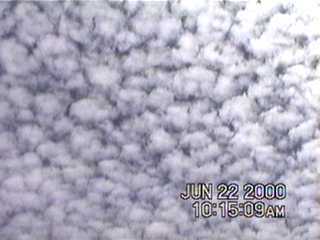 The material of the “clouds” is shown to have density, form and behavior unbecoming of water vapor, and it has all the appearances of being at least in part of a synthetic nature. 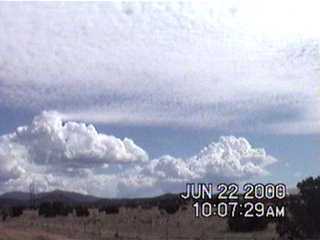 This material and form of “cloud” has been observed on numerous occasions in Santa Fe NM during the past year and a half of the spraying program, and has always been suspect because of the unusual textures observed. 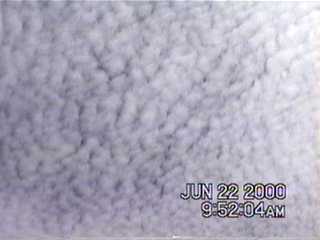 The patterns and textures referred to have frequently been described as “cottage cheese” or “tortoise shell” in nature by some observers (a classical assumption would be alto-cumulus). This is the first case that I am aware of that visibly demonstrates the disturbance of this material, and which reveals that it simply is not water vapor under the conditions recorded. 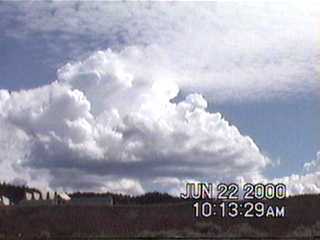 As can be seen throughout the progression, this “cloud layer” would conventionally be described in terms of cirro-stratus and alto-cumulus categories, and later can be seen to merge with cumulus formations over the mountains of Santa Fe. 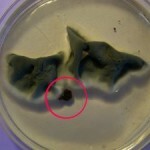 The last photograph shows the progession during mid-day. 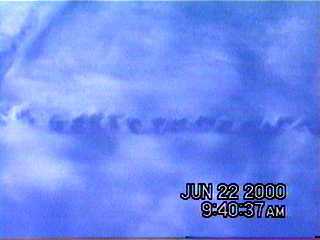 The material that is shown in the earlier part of this progression commonly leads to the circular rings around the sun, as described earlier on this site and within the Real Media reports as resulting from hexagonal crystals of uniform size. 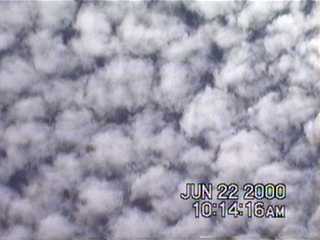 The “clouds” themselves can often be seen to be colored at the edges from refractive effects of the material within, especially through polaroid or sunglasses. 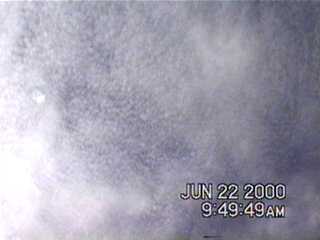 The “clouds” that are frequently seen in combination with spray operations are not composed fully of water vapor as may be commonly assumed. The photographs presented herein are further demonstration of this fact. A video segment of this session will be presented later if time permits. Professional meterological comments on the message board are always welcome.